Homemade Camper - You'll Be Proud Of It! A homemade camper van conversion can be an inexpensive and highly rewarding project, but you need to plan accordingly before you jump in to it. You really don't want to get stuck with something you didn't want in the first place, don't you? 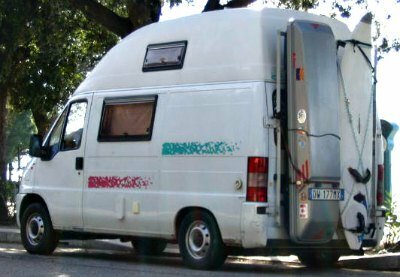 If you don't wish to blow your budget on professional van conversions, a homemade project may be an only option on your way to camper van freedom. And If you have some basic DIY skills there is absolutely no reason for you to back out. An increasing amount of people is converting their vans to campers. It's not that hard to build your own camper van. Used vans are easy to find and all kinds of DIY tools, material and information are widely available either at specialized stores or on the net. So go visit your local DIY store, check the internet, go to forums on this topic or get a book on camper van conversions and get your creative juices flowing before starting your adventure. Don't forget to use used camper parts. You can source them out on eBay, your local scrap yard or anywhere else you can think of. Try to be resourceful! I understand that the first steps can be quite confusing. I remember myself at the beginning, an empty van, a garage full of camper parts, plywood, insulation and camper windows just waiting there to be put together into something reasonable but. . .
. . .I didn't have a clue where to begin! But just like everything in life, pieces started falling together and I never looked back. . .
Homemade camper van conversions are able to add a whole new adventure to your lifestyle, but before jumping in try some camper van rentals, or your friends camper van if possible, for a couple of weeks, just to see how things work out for you and other people or pets that will most likely be traveling with you. Making the right choice now is far better than having a lot of headaches later on! Do you have your own camper van conversion? Share Your Camper Van using the form below! Homemade Camper - Choosing The Right Size! First of all you need to determine the size of your base vehicle for your homemade camper conversion. You have a wide variety of vans available on the market, everything from small vans all the way up to long wheel base high top roof vans. And I will not suggest any brand names, because everyone can have their own favorite. A couple may find a simple mini van or a travel van with a bed and some storage place underneath a perfect option for their needs. Now, you can cook a meal outside on a propane cooker and wash yourself with a bottle of water, can't you? A great addition to small campers might be a roof tent. You keep your gear and maybe even a small kitchen in your camping van and sleep on the roof away from bugs and humidity. If you need a daily driver or a second car you might consider a pop top camper as your best option. On the other side you can get a high top van and install an elevating bed on the top giving you lots of headroom during daytime and a cozy bed at night. And if you really want to push the limits, 4x4 camper vans are your best answer! There is no single best answer and just remember that simplicity rules. A lot of people are more than happy with their old Westfalia camper vans for decades, or so. Just in case you wish to take a look at my finished van project or share your own camper van, hop on the image rich van campers page. 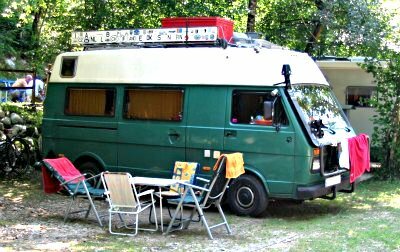 Here is a list of the basic components of a fully equipped camper van conversion just to get the idea, but you can of course skip any of these components if you feel that for some reason you will not be using them. And take a look at this D.I.Y Volkswagen camper van conversion video, just to see what can be done with a little bit of creativity. There are many camper vans for sale to choose from, but do take your time. Remember that you will probably keep your camper van conversion for quite a while so the last thing you want, is to rush things at this stage. So take your time and research thoroughly. Courier companies are usually your best bet because they take care of their vehicles, change them frequently and you get a full service history to go with. They will have a couple of bumps and dents but that is nothing to worry about because you'll probably get some yourself anyway. You could check out ambulance vans, army vans, road assistance vehicles or anything you can you can get your hands on. So keep your eyes open on eBay or any other trading post you can think of. If you are going to build your own camper you need a vehicle in top mechanical condition. And if you're not the technical type take along a friend who understands mechanics. Engine size is also important because your homemade camper will be a lot heavier when finished with all the furniture and other equipment loaded inside. Loaded up with camping gear and passengers you will probably be reaching maximum payload limits! The overall condition of the vans bodywork is important as well, so check carefully for rust and leaks. A few small spots are not a problem that you can't fix, but stay away from large rusty patches unless you feel confident to deal with them later on. Kilometers or miles on the clock are not all that important. Most modern day vans run on clean turbo diesel engines which are real workhorses and will just run and run. At the end, go for a test drive, try the steering, check the brakes and the gearbox. Try all the features in the cabin and listen for strange noises. Drive it and try to park it just to get the right feeling. And remember that driving an empty van might be a bumpy ride, but it gets much smoother once you furnish a homemade camper with all the furniture and appliances. Do You Travel Around In a Homemade Camper ? Click here to see the rest of the form and complete your Homemade camper van review.